Vaccon vacuum check valves seal and hold vacuum for safe, energy efficient operations for clamping, pick & place and vessel evacuation applications. Vaccon vacuum check valves are designed specifically for vacuum applications. They offer high flow capacity with minimal flow restriction and feature extremely low cracking pressures of less than 1”Hg [33.86 mbar]. The large unrestricted flow path ensures high flow at low vacuum levels. The low cracking pressure allows the vacuum system to reach its maximum vacuum level before the check valve seals off the system. 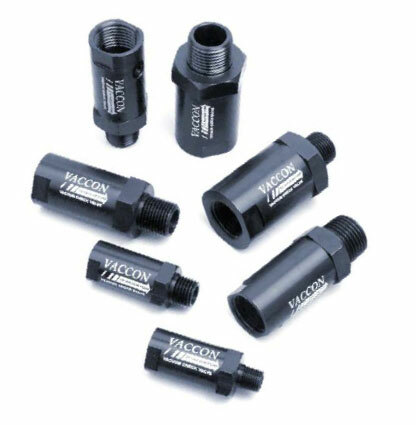 Vaccon vacuum check valves are made of durable anodized aluminum with an internal flexible valve sealing mechanism. With their high flow capacity and low cracking pressure, Vaccon vacuum check valves offer rapid evacuation which increases process or production speed and reduces cycle times for more efficient operations. In contrast, most spring-loaded check valves marketed today are designed for high pressure systems and have high cracking pressures. When used in vacuum applications, spring-loaded check valves severely restrict vacuum flow, hindering the performance of the vacuum pump by slowing down evacuation speed and wasting energy. Product data for Vacuum Check Valves including dimensions, materials, weights and fittings is found in the data sheet.